The details have been lost to history. But thousands of years ago—as early as 3000 B.C.—mankind discovered salt not only delayed the spoilage of precious proteins like meat and fish, but when laced with small amounts of sodium nitrate, sodium nitrite, or potassium nitrate (saltpeter) there were even more benefits: an appealing color, improved taste, and better texture. Most importantly, these potent compounds could destroy dangerous food-borne pathogens like Clostridium botulinum, aka, botulism. First identified in Germany in the 1820s after a deadly outbreak, the botulinum toxin has been dubbed “the most poisonous of poisons” by scientists. It was named after the Latin word for sausage, botulus, because the victims being studied died after eating improperly cured sausage, sausage that did not contain bacteria-fighting nitrates or nitrites. While curing salts might seem like an obscure subject, a growing number of home pit masters—inspired, we hope, by Steven’s book Project Smoke and TV show by the same name—have started curing and smoking their own bacon, pastrami, sausage, jerky, etc. It’s critically important to you and the people you feed that they be used correctly. It was widely reported in the 1970s that nitrates/nitrites were carcinogenic. That conclusion, based on a now discredited study, was later refuted by the National Toxicology Program, an agency within the U.S. Department of Health and Human Services. Nitrates/nitrites are not only safe when used at approved levels, but integral to human health. Research conducted during the past 30 years indicates that nitrites may prevent cardiovascular disease, sickle cell anemia, and strokes as well as aid in wound repair. The maximum amount of nitrites allowed in cured meats by the USDA and the FDA is 156 parts per million (ppm), and is usually lower than that. Some vegetables contain many times more nitrates/nitrites than cured meats. Not convinced? It’s been reported that 1 serving of arugula plus 2 servings of butter lettuce plus 4 servings of beets contain nitrites equivalent to 467 hot dogs! And those “nitrate free” or “no nitrates added” hot dogs or other meats you’ve been paying a premium for? They’re a “huge hoax,” says Jonny Hunter, the founder of Wisconsin-based Underground Meats, in The Atlantic. They contain nitrate- and nitrite-rich celery powder or juice. Below are descriptions of the most common curing salts and how to use them. Confusingly, these compounds (mixed with good ol’ sodium chloride) are sold under a variety of names to commercial and amateur smokers of meat alike. You can buy most of them from our online store. Prague Powder #1: Alternate names include pink curing salt, Insta Cure #1, sel rose, quick cure, tinted curing mixture (TCM), Modern Cure, DC cure, and DQ cure. Prague powder is a generically named compound (the aforementioned patent expired decades ago) that contains 6.25 percent sodium nitrite and 92 percent sodium chloride as well as an anti-caking agent and a very small amount of FD&C Red No. 3 to dye it cotton candy pink and distinguish it from other salts in your kitchen. A mere 4 ounces will cure 100 pounds of meat (use 1 level teaspoon for every 5 pounds of meat). As some of its alternate names imply, it works quickly. Meats like sausage can be smoked or cooked right away. If brining, use 1 tablespoon per gallon of water and allow enough time for the salts to penetrate the food, usually 24 hours. Follow the manufacturer’s directions carefully. Again, nitrates/nitrites can be toxic when not used in the recommended proportions. 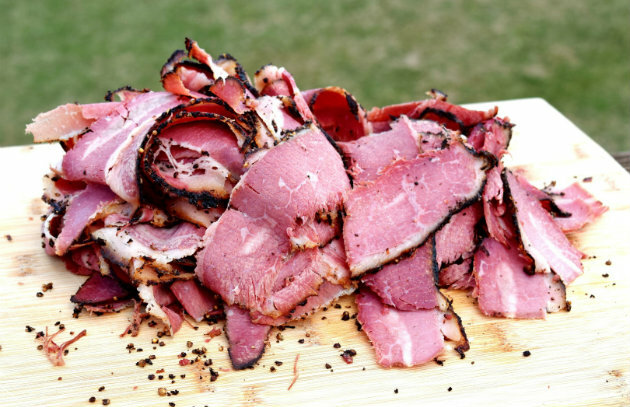 Use for wet-cured hams, jerky, salami, pastrami, sausage, cured fish, corned beef, and bacon. 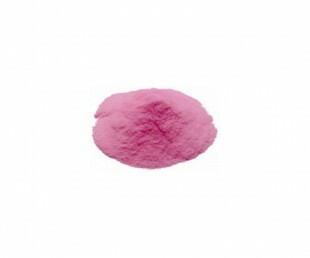 Prague Powder #2: Sometimes sold as Insta Cure #2 or Slow Cure, this coral-colored compound contains 6.25 percent sodium nitrite, 4 percent sodium nitrate, and 89.75 percent sodium chloride (salt). While Prague Powder #1 works quickly to cure meats, the antimicrobial powers of Prague Powder #2 are released over time (weeks and/or months versus days) as the nitrates morph into nitrites. One level teaspoon will cure 5 pounds of meat. Use for products that will be dry-cured for an extended time, such as country-style hams, prosciutto, salami, pepperoni, and other dry sausages. 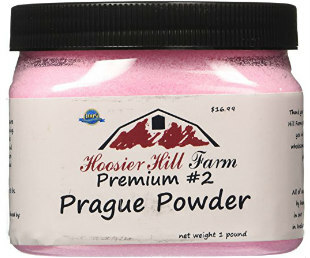 Note: Prague Powder #2 is not sold in Canada, where nitrates are prohibited. 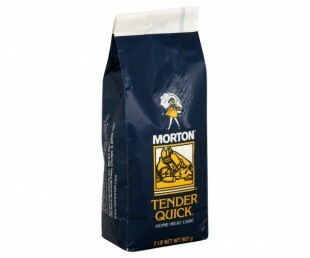 Morton® Tender Quick®: This product has no alternate names. Sold at the retail level in 2-pound bags, Tender Quick® contains salt, sugar (also a preservative), an anti-caking agent, and one-half percent each of sodium nitrite and sodium nitrate. It is less concentrated than other curing salts, and unlike the salts above, is not pink. The company’s recommended formula for dry cures is one tablespoon of Tender Quick® for every pound of meat. For a wet brine, add one cup of Tender Quick® to four cups of water. Use for cured and smoked meat, poultry, game, and fish, such as salmon, shad, and sablefish. Label all meats in the curing process precisely, noting any special instructions and the date(s) they need attention (turning, refreshing the brine or dry rub, smoking, etc.). Transcribe the dates to your calendar. Unless air-drying, always hold meat at temperatures between 36 and 40 degrees F.
To avoid excessive saltiness, soak cured meats or fish in cold water, then air dry before smoking or barbecuing. Avoid the “what-the-hell syndrome,” which holds that if some is good, more is better (e.g. hot sauce, bourbon, wood chips, etc.). When it comes to curing salts, use exactly the recommended quantities. Store them in the original containers and scrupulously follow the directions on the package. Again, when not used properly, nitrates and nitrites can be toxic. When using curing salts in a dry rub, mix thoroughly with the other dry ingredients before applying to the meat or fish. Salt draws moisture out of proteins. If dry-curing, routinely drain off any liquids that accumulate. Turn the food curing in your refrigerator once a day. Use distilled water instead of tap water, which contains impurities. Use nonreactive containers or sturdy resealable plastic bags when curing pork bellies, beef brisket, jerky, etc. If brining for longer than seven days, replace the brine with a fresh mixture to avoid spoilage. What are YOUR favorite meats and seafoods to cure?